Beautifully engraved certificate from the Valley Railway Company issued no later than 1880. This historic document has an ornate border around it with a vignette of a train. This item is hand signed by the Company’s President and Secretary and is over 126 years old. VALLEY RAILWAY COMPANY, Main Line of Road.—Cleveland, 0., to Valley Junction, 0	75.50 Kranzroy : Kruwroy to Cottage Grove 5.00 Branches : Willow: Willow to Newburg	3 33 Other Short Coal Branches	9.67-93.50 miles. Sidings, etc., 38.8 miles. Gauge, 4 ft. 84 in. Rail (steel, 70 miles), 56 lbs. History — Organized August 21, 1871 ; road opened to Canton February 1, 1880 ; to Mineral Point, July 15, 1882 ; to Valley Junction, January 1, 1883. Rolling Stock.—Locomotive engines, 21. Cars—passenger, 21; baggage, mail and express, 4 ; freight (box, 58 ; stock, 2 ; platform, 104 ; coal, 720), 884 ; caboose, 4 ; other cars, 19—total, 932. Of the above the following were acquired by car trust : Locomotive engines, 11. Cars—passenger, 11; baggage, mail and express, 1 ; freight (box, 4 ; stock, 2 ; platform, 100 ; coal, 420), 526 ; caboose, 4 ; service, 11—total, 558. Operations for year ending December 31, 1888.—Train mileage—passenger, 200,688; freight, 229,973; mixed, 457,726; other, 24,273—total, 912,360 miles. Passengers carried, 289,609 ; carried one mile, 6,576,959 ; average mile rate, 2.03 cents. Tons freight moved, 1,101,868 ; moved one mile, 38,649,905 ; average ton-mile rate, 1.34 cents. Trustee, Central Trust Co., New York. 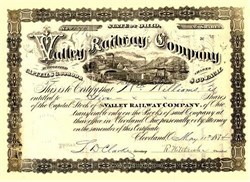 The Valley Railway Company was incorporated on August 21, 1871 to build a line from Cleveland to reach the coal fields in southeastern Ohio. Construction began in 1873, but was suspended during the financial 'Panic' of 1874. Construction was resumed in 1878 and the 75-mile line was completed in 1882. It went south from Cleveland through Akron to Valley Junction, Ohio. In January, 1890, the Baltimore & Ohio Railroad Company acquired control of the company. At the same time the Baltimore & Ohio Railroad Company had purchased properties along the Cuyahoga River in downtown Cleveland to develop terminal facilities, including both passenger and freight stations. The ornate passenger station was opened in 1898. A Baltimore & Ohio Railroad Company subsidiary, the Cleveland Terminal & Valley Railroad Company, was incorporated in 1895 and it acquired the B&O terminal properties and the Valley Railway Company. The Baltimore & Ohio Railroad Company assumed operation of the Cleveland Terminal & Valley Railroad Company in June 1909 but did not absorb the line until 1915. Later, in 1934, the Baltimore & Ohio Railroad Company transferred its passenger trains to the new (built 1931) Cleveland Union Terminal, located northeast of the Baltimore & Ohio Railroad Company terminal. History from the Baltimore & Ohio Railroad Historical Society.